The near point of an eye is defined as the nearest point from the eye up to which eye can see objects clearly. The nearest point of normal human eye is 25 cm from eye. Conjunctive, ciliary body, aqueous, iris, cornea, pupil, lens, optic nerve, macula, retina, sclera, vitreous, etc. 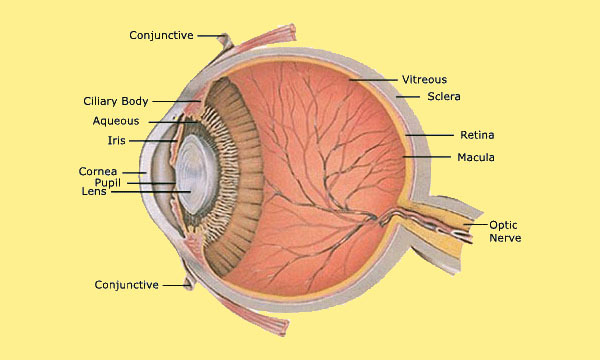 are the parts of human eye. Far point of an eye is defined as the farthest point from the eye which can be seen clearly. The far point of human eye is at infinity. Near point of an eye is defined as the nearest point from the eye upto which eye can see objects clearly. The nearest point of normal human eye is 25cm from eye. Defects of vision of eye: Long sightedness (Hypermetropia) and Shortsightedness (Myopia). The causes of hypermetropia are increment of focal length, shortening of eye ball etc. The causes of myopia are decrement of focal length, elongation of eye ball etc. What is meant by near point and far point of vision? The near point is 25 cm and the far point is infinity. The nearest point up to which an object can be seen clearly is known as near point of vision. Similarly, the farthest point up to which objects can be seen clearly is known as far point of vision. What do mean by defects of vision? The defect of eye due to which the image of distant or nearer objects is not formed at retina is known as defects of vision. Hence, the object appears un-clear. If the cilliary muscle does not function at all, what type of the defect has the person got? What is short-sightedness or myopia? What is the main cause of short - sightedness? The size of the eye ball is too large or long. The focal length of eye lens is too short. What is long-sightedness or hypermetropia? What is the main cause of long - sightedness? The size of the eye ball is too small or short. The focal length of eye lens is too long. Short-sightedness cannot be corrected by the use of convex lens, why? 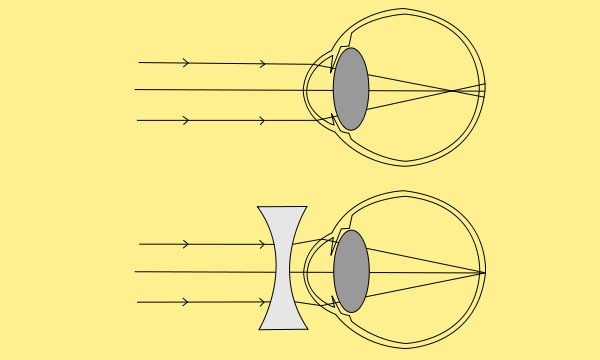 For an eye with short-sightedness, the light rays coming from distant objects should be diverged to retina which is possible only by using concave lens as concave lens is a diverging lens. Therefore, convex lens, being converging lens cannot be used to correct the defect of short-sightedness. Write down any two differences between eye and camera. The focal length of eye lens can be changed by the power of accommodation. 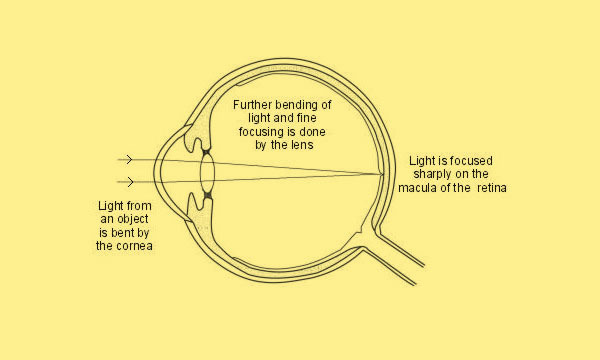 The distance between the eye lens and the retina is fixed. Hence, the focusing is done by changing the focal length of the lens. The focal length of the convex lens is used in a camera is of fixed type. Hence, adjusting the distance between the lens and the film does focusing. Image is formed on the retina. Image is formed on the film in camera. The change in focal length of an eye lens to focus the image of objects at varying distances is done by the action of _______. Hypermetropia is rectified by using ______. Myopia is rectified by using ______. The least distance of distinct vision for infants is ______. Image is formed on ______. What is the function of aqueous humour ? what is the function of aqueous humour? Any Questions on 'Human Eye '?